This one of my most cherished recipes because I searched for it for many years! Scones are the simplest but also the most coveted and celebrated of English cakes and for years I had been baking them in Paris for my friends and looking for the definitive recipe… Until my future mother-in-law baked me the lightest and yummiest scones, years later in Surrey, and kindly let me have this version of the most English of English cakes. I recently baked a tray of them for tea with my girlfriends at Christmas and I post this for Caroline who asked me to do so! Start by mixing all the ingredients but the milk and work through them with the tip of your fingers until they form a light powder. Add the buttermilk or milk and knead lightly with a wooden spoon. It must be moist but not too sticky. Roll out on a floured marble surface and make a thick slab then cut it with a round cutter in as many shapes as you want. Each scone must be nice and thick: about 1 inch or 2 centimetres. Put them on an oven tray dusted with flour and put in a hot oven (200 degree Celsius) for 10mn or until nicely raised and brown. Serve warm with clotted cream and strawberry jam – I used mascarpone instead of the golden clotted cream when in France. Serve with a cup of hot tea and enjoy! 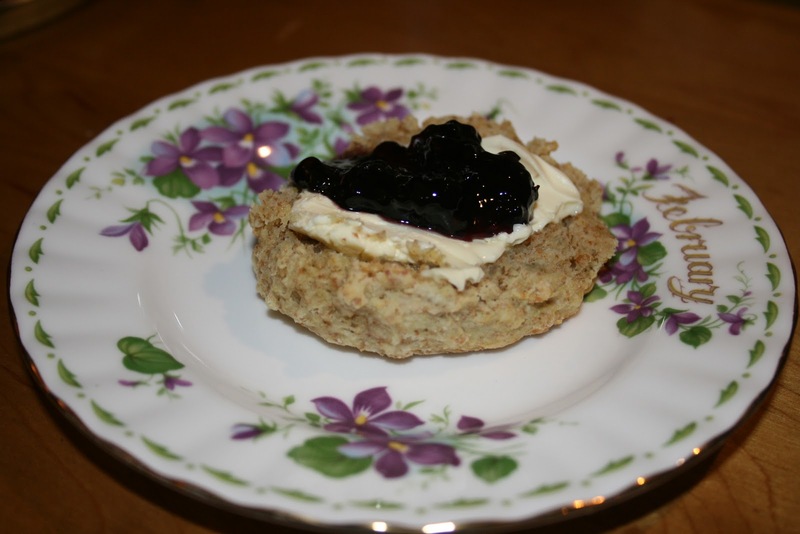 This entry was posted in family favourite and tagged buttermilk, english, scones. Bookmark the permalink. >Absolutely incredible and scrumptious!! This is the ultimate recipe for scones. I baked them on sunday for breakfast and they disapeared as quickly as they were made.Many thanks Diane! !